Scenario #1: Your client doesn’t like the work you’ve presented. We’ve all had it happen — you think you’ve written a brilliant feature story, designed a knockout website, created a fantastic logo, brainstormed a clever ad campaign. You hit SEND with the utmost confidence, eager to hear how much the client loves it. And then you get the call: “Well, it’s not really what we were looking for.” After picking up the shattered pieces of your ego, what’s the next step? Assess the damage. Calmly and coolly, find out where you missed the mark — without being defensive. Find out what needs to be done to make the client happy. It may be uncomfortable to ask, because you’re fearing the worst, but you need to get as specific as possible. Deliver the goods — or don’t. If you can execute the changes, it’s time to reassure the client and establish a timeline. However, if you get the sense, like Austin Powers in Goldmember, that there will be no option from waffles to pancakes that can please the client, you have a decision to make: You can simply cut your losses and eject from the project, accept a kill fee, or try to collect for completed work. Congratulate her and ask about her new position. You’re sad for yourself, but you need to put on a genuine happy face. Offer to help. Emphasize how much you’ve enjoyed working with him and would like the opportunity to continue doing so. Ask for an introduction to the replacement. New people often bring their own freelance stables with them. But it never hurts to ask, particularly if you have a long relationship with the organization. Scenario #3: Your client goes out of business…before you’ve been paid in full. As P.S. Jones at Diary of a Mad Freelancer points out, it’s lame to blame everything on the down economy, but the fact of the matter is that a lot of formerly booming businesses have gone bust in the past few years. What to do when your client files for bankruptcy? Get in line. Make sure that the accounting department is aware of the unpaid invoice. As a “general creditor,” you actually have a decent chance of recovering some or all of your losses, depending on which bankruptcy chapter was filed. Be patient. Proceedings will take a while. I once received a partial payment about 2 years after a client went under — in fact, I’d completely forgotten about it, so it was better than finding a $20 in an old pair of jeans. A partial deposit before commencing work is your best defense against worst-case scenarios. At least you’ve been paid something, and it gives you leverage if things go awry. Diversify, diversify, diversify. A freelancer whose livelihood depends on one or two big clients is one or two phone calls from disaster. For all the good freelancers out there: What do you do when bad things happen? I would add something to #1 based on personal experience – another reason they could be unhappy is they’re using it as an excuse to avoid payment. I have a client who had to be fired because first, they paid me too little on the agreement that any other projects would be paid at my rate. Second, when I billed them for other projects, they argued my rate and made the fatal mistake of saying “We don’t see the difference between writing this post and writing a press release, so we’re going to pay you at the blog rate.” Hell no you’re not. You’re paying or I’m walking. I didn’t give them the chance. I collected my fee and walked. They came back, begging me to return at MY rate. Great! Only now they’ve taken to arguing every other blog post. They’ve managed to squirm out of paying for one, but this next one, no way. I just got an email from them last night – they want an entire rewrite on a different topic because it suits their fancy. They don’t pay me enough to waste time arguing, so I’m making the small revisions they’d first mentioned, then letting them go entirely. I’ll get payment or I’ll get lawyered up. Thanks, Lori — that is certainly an ugly scenario. I’ll look forward to hearing the outcome (hopefully sans attorney involvement). While we’re on the topic, I also recommend readers check out your blog post “Stick a Fork in Me,” which provoked a good discussion about someone claiming phantom grammatical errors as an excuse to not pay. Very often, they leave without even the courtesy of telling you they’re going. And then, you hear from a new person who wants to institute new policies –like paying less. It’s important to be polite and firm and not agree. Deposits are vital to freelancers. It also indicates that the client is serious, and won’t just vanish into the ether after contracting the work — I’ve had that happen a few times, too. Client books me, contract is in place, I turn in the work on time, never hear from the client again, and suddenly, address/phone/email no longer valid. But at least I had the deposit, so it wasn’t a total loss. Thanks for commenting, Devon. You’re right about standing firm (if you get the opportunity to work with the new regime), and the leverage that a deposit offers (when someone tries to flake). Thanks for weighing in! RT @DrFreelance: When bad things happen to good freelancers: http://ow.ly/3dKrj // Excellent advice. 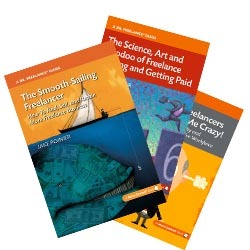 RT @KOKEdit RT @DrFreelance When bad things happen to good freelancers: http://ow.ly/3dKrj // Excellent advice.